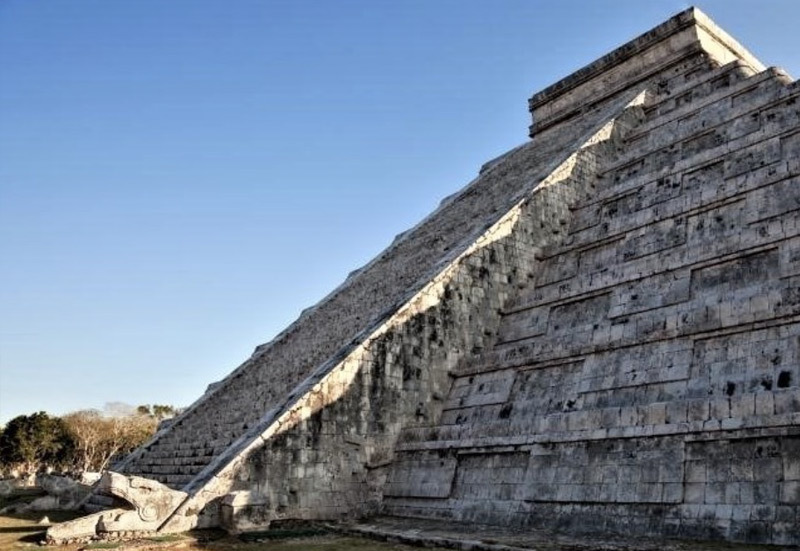 Twice a year, at each equinox, the sun plays with the angles of the northeast stairway of the Kukulcán pyramid at Chichén Itza (called El Castillo in Spanish). The course of the Sun project the shadows of the corners of the pyramid onto the vertical face of the stairway balustrade, giving the visual impression of an undulating serpent body slowly crawling down toward its stone head at the bottom of the stairway. The event draws thousands of tourists that gather on the Grand Plaza to witness the event. They come to share in a communal spirit that transcend time and culture. 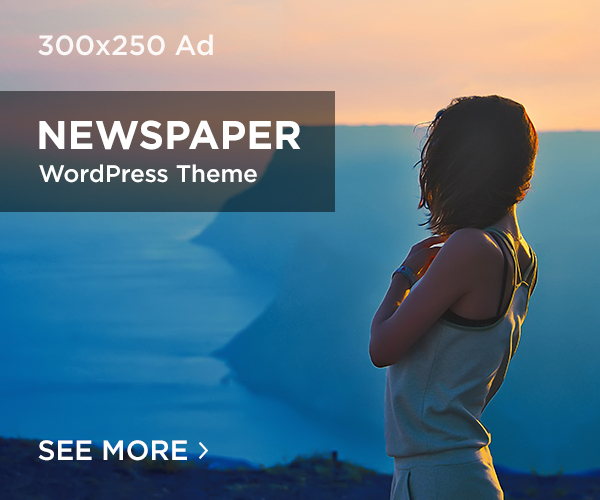 In our time of extraordinary fast changing industrial and scientific world, unimaginable fifty years ago, people search for mythical answers to contradictions in this swiftly moving world. In Maya, Chichén Itza is made of the words chi or mouth and chén for well; and Itza, for itz or sorcerer and a (or ha) for water. The city’s late name therefore, translates as “the city of the water sorcerers”. For the ancient Maya, the Kukulcán temple-pyramid was the four-sided temple-mountain, representative of the fourfold partitioning of the world. It is reminiscent of the Creation Mountain, with its enormous Feathered Serpents on each stairway, mouth agape at the bottom. The serpent symbol was widespread in Mesoamerican cultures. It is profusely shown on numerous stone steles and temple columns, painted on fine ceramics and woven in fabric. 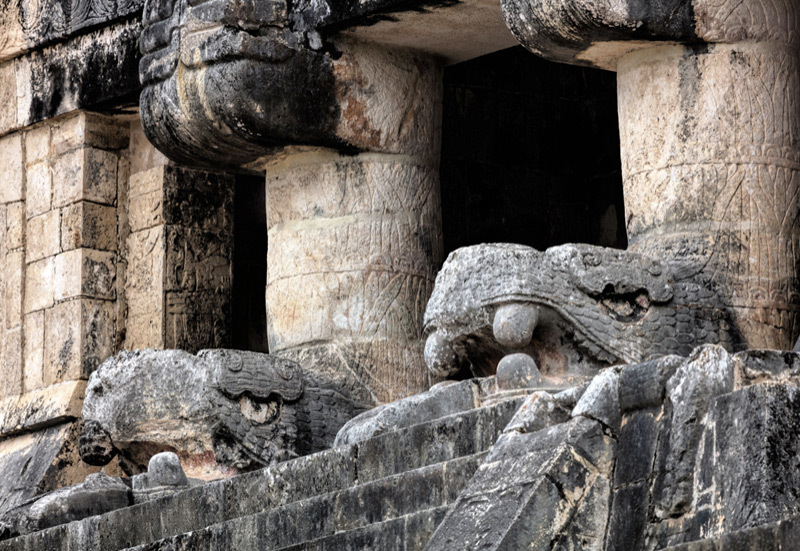 Kukulcán is not cardinally oriented and mythologically sits at the center of time and space. Its corners lined up on a northeast-southtwest axis toward the rising sun at the summer equinox, and its setting point at the winter equinox, making the pyramid a monumental sun dial for the solar year. Each of the temple-pyramid has 52 panels contained in the nine terraced steps, equal to the number of years in the Toltec cycle. The main doorway of the outer temple at the top of the pyramid opens to the north. The four stairways ascending the pyramid, one on each side have 91 steps each, equal 364 steps that, with the temple at the top, total the 365 days solar year, the haab’ in Maya. The north stairway is the main sacred path that is on its northeast balustrade where the Sun cast triangular shadows. 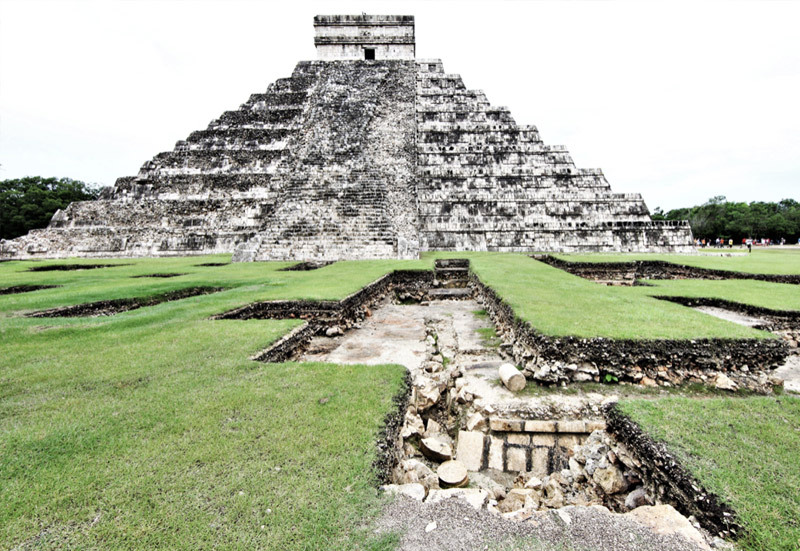 The great plaza that surrounds El Castillo on four sides represent the Primordial Sea of Creation, from where is believed all life sprung at the beginning of time. The plaza North side was the area of major ritual ceremonies, bordered by the Venus Platform, close to that of the Jaguars and Eagle Warriors, then behind it, the skull rack, or Tzompantli in the Aztec language. Beyond is the massive Temple of the Warriors on the east side, and the no less important Ball Court to the west; the largest in the Americas, 552ft long x 300ft wide. The plaza was closed by a wall over seven feet high, with a limited number of entrances, among which is the one leading to the sacred well (sacbeh.1). Most buildings are oriented 17 degrees off true north; Kukulcán is 23 degrees off. Two other portals, or spiritual gateways, are linked to the temple-pyramid, one natural, the other man-made. 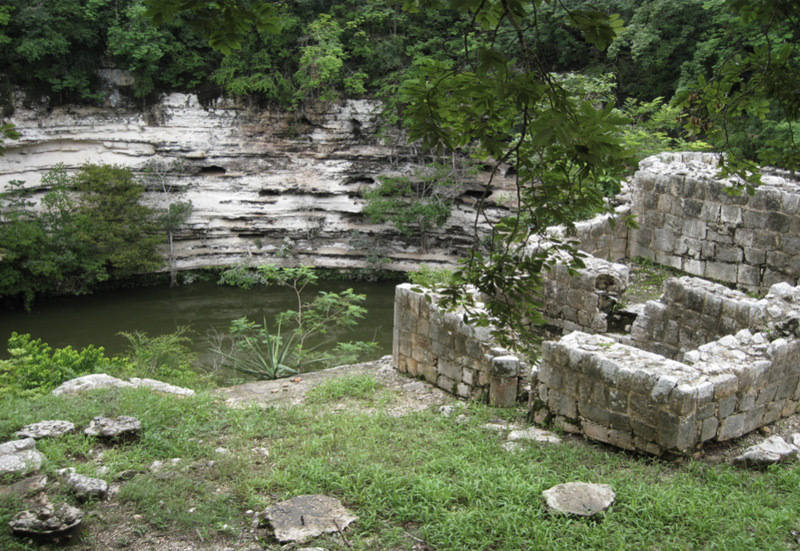 The first is the huge sacred cenote, or sink hole, referred to as the “Great Well of the Itzas”. The well was not used for domestic purposes, but exclusively for rituals. It is reached by a large elevated sacbeh, Maya for white road, heading 900ft northward from the Great Plaza and the Venus Platform. The cenote was believed to be the place of communication with the gods of Xibalba, the “Place of Awe” or underworld, as well as with Cha’ak the powerful Maya god of rain, lighting and thunder. The seasons and the metronomic passage of heavenly bodies were already understood as essential markers to alleviate anxieties of daily life by their repeated familiarity, enshrined in belief structure and ceremonies spanning thousands of generations. Other monuments of the ancient city are also associated with the spiritual view of the world, integral to carrying out the administration of the city. Need be noted, that were then no separation of secular and religious functions, they were one and the same. Not unlike those found in contemporary societies today. The sacred well is oval shaped (164ftx200ft); from its lip to the water the drop is 72ft, its depth is 65ft, plus a bed of mud about 20ft thick the bottom. The structure built on the lip of the cenote sagrado, was used as a steam bath to prepare sacrificial victims to the gods. Gifts to the gods were precious jade and metals, very fine ceramics and lives. Each offering was made in accordance with the needs of the time and the demands of the gods. The archaeological record show that human sacrifices were of both gender and of any age. In time of dire needs such as a persistent drought, a community would sacrifice its best, not the sickly or the maimed; sacrificial victims had to be able and in their prime. Gods would not accept anything less. The socio-economic organization of Maya communities of the past were based on agriculture. Their belief structure and religious organization inherited from past generations, adhered to their daily partnership with nature. The gods and deities from their pantheon of belief therefore, were those driving the fundamentals of nature of which the Sun, Rain and the Vegetable World where foremost, as was Maize (corn), in one word: Food. Planting and harvesting therefore were essential daily concerns together with the weather, rain specifically, since its scarcity could translate into bad or no crop, and its consequences: famine and death. The milpero (farmer) profound mystical relationship to corn’s mythological substance, as well as the actual sustenance of mankind, is a way of life entirely alien to non-traditional communities of the Americas. Concepts enshrined in the sacred book, the Popol Vuh or Book of Counsel of the Maya Kiche, describe the gods creation of the universe and that, after failing four times, succeeded in creating man out of Maize dough. Above all, ancestors were believed to participate at every stage of a family daily life and, for this reason, were prominent recipients in auto-sacrifice ceremonies, before gods and deities. The serpent shown on monuments and sculpted columns is a metaphor, not the representation of the zoological animal. Its body as it moves, is reminiscent of the swirl of smoke of auto-sacrifice when one’s own blood is shed on bark paper, then burned, the swirling smoke carrying the prayers of the supplicant to the ancestors, seeking their guidance for living another day in a dangerous world. The second portal is the man-made spiritual gateway, the Great Ball Court on the west side of the Great Plaza together and its Temple of the Jaguars. 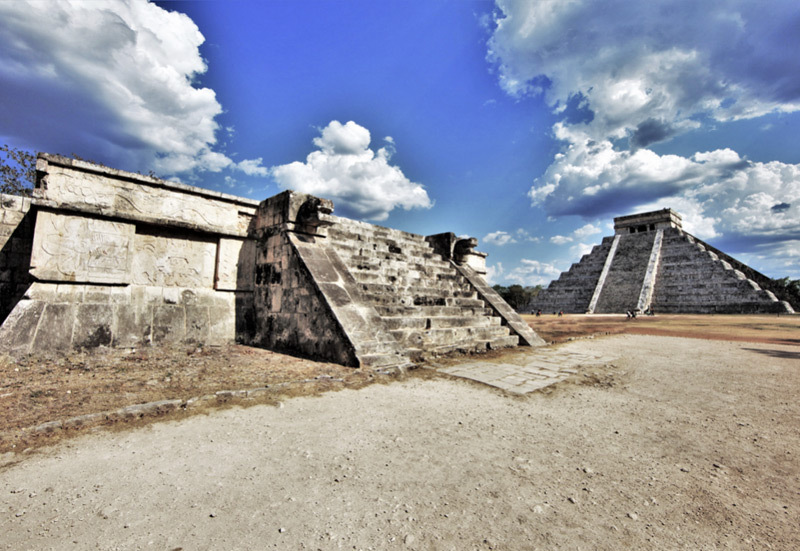 For the ancient Mayas, the ball courts opened literally into “otherworlds”. Ball playing as a ritual, was a fateful game destined to end in sacrifice. The metaphor that took place in the ballcourt reflected the tribulations of life, death, evil and disease that defined human destiny and history. Kukulcán is the Maya Yucatec name for Quetzalcoatl, the Feathered Serpent, god of agriculture, the weather and a new man under the Fifth Sun. He came in the early 10th century with the Toltec conquerors that migrated from Tula on the central plateau of Mexico. Together with Maya Chontal groups from the northwest of the Yucatán peninsula, they conquered Chichen. The ball court architecture, its bas reliefs in particular, are very similar to El Tajin, at the end of the Classic. The outside panels with symbols of Quetzacoatl in particular, denote the cult’s origin from Xochicalco. The Mexicans introduced human sacrifice, on a scale never known previously to the Maya. Military expansion aimed at dominating the surrounding land and people that, together with control of the salt trade on the north coast of the peninsula, gave the Toltecs command of northern Yucatán. 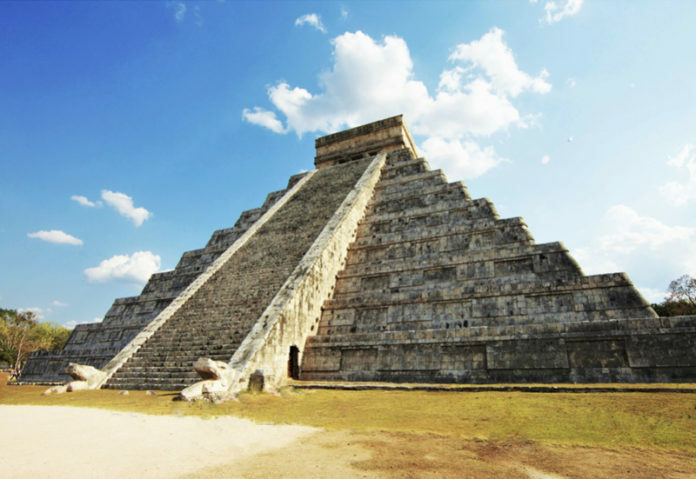 Chichén Itza today is not the city that was conceptualized by the Maya before the arrival of the Toltec-Itza invaders; long before, it was called Uuc Yab’nal (the city’s name in Maya Yucatec). Archaeological investigations brought to light a smaller pyramid of nine terraced bodies within Kukulcán (below – A. Ruz L. 1967:33). The single stairway of the temple faces northwest, has only 61 steps and a simple structure on top with two parallel galleries. There is a triple molding on its façade and a frieze showing a parade of jaguars, shields and two intertwined serpents over the entrance. The similarities between the two pyramids underline that the one within is also of Toltec origin. 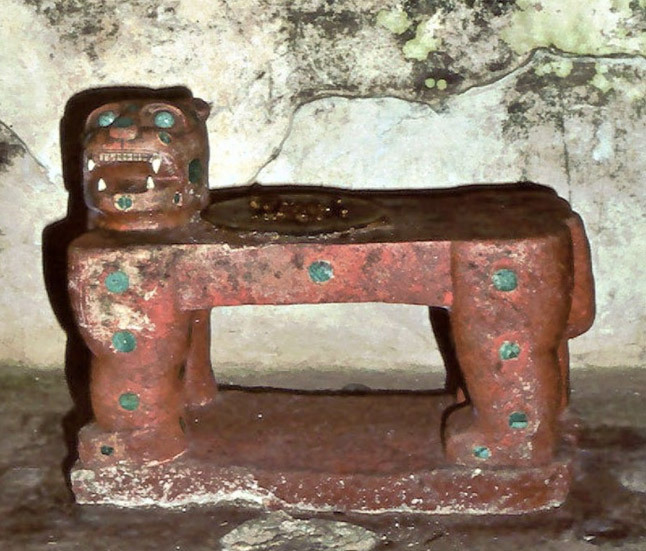 In the antechamber of the inner temple was found a red jaguar that may have served as a throne for the High Priest. On the seat, was an offering of a turquoise mosaic disk. The jaguar (tigre in Spanish), is painted red on lime stone, the teeth made of flint, and incrustations of fine jade disks for its eyes and on its body, for the animal spots. A mere 2.2 miles from Chichén Itza is the cave of Balankanchè, integral to the ancient city religious structure, for its proximity and contemporaneity with the Toltec occupation. 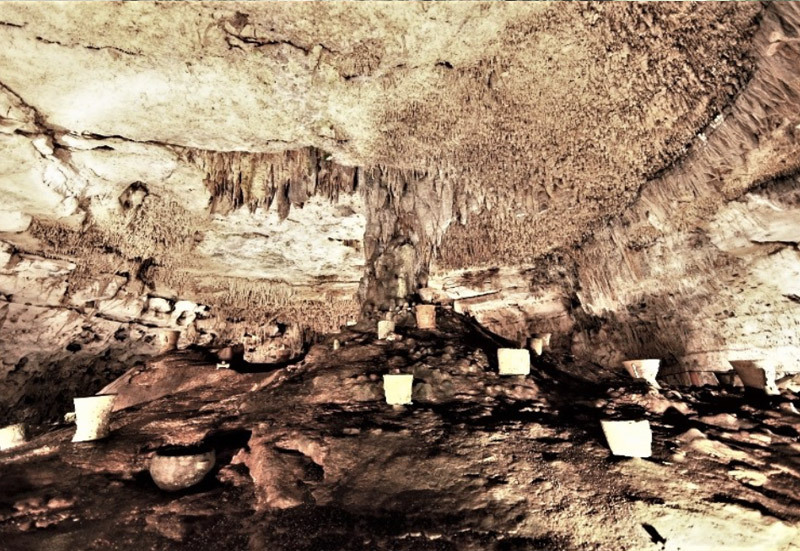 The cave is replete with ceramic urns of the god Tlaloc, Aztec equivalent of Cha’ak the Maya god. For detailed information on the cave, please see in this serie “Balankanchè, Altar of the Tiger Priest”, and more in “Balankanchè’s Cave, Throne of the Tiger Priest” in the “Lecture” series and the photo Portfolio at www.mayaworldimages.com. Then as today, traditions were similar to those seen on more recent temple-pyramid, that symbolically show the same concern for life’s daily predicaments. Was the serpent’s shadow seen and interpreted mythologically on the now hidden pyramid within Kukulcán?, we do not know. There is much more to be said about Chichén Itza, and far more to be learned yet hidden, as the inner pyramid was for years. Excavations in the Great Plaza, started in 2009, revealed buried structures that pre-date Kukulcán. What will we learn from this still buried past before the great temple-pyramid was built, is still to be discovered. We will visit Chichén Itza again of course, since we had but a glimpse of the ancient city that has so much to offer. Understanding the “hows”, “whys” and “whens” of its great past will take a few more “stories”. Other major monuments will be presented together with their function and purpose, from Old Chichén, to the Observatory (or Caracol), the Temple of the Warriors and its 400+ carved columns and the Temple of the Three Lintels, the cenote Xtoloc, the Great Pyramid, the Chinchán-Chob or Red House, the Nunnery that together with the Akab-Dzib are among the oldest buildings, and much more. Will the serpent’s shadow of the equinox help future visitors in their quest for balance in their modern lives? Their inquiry notwithstanding, they will leave this great Maya city, and return home with fascination and wonder: what else does the pyramid holds in its shadow? But before traveling back home, head east to the Riviera Maya on the Caribbean coast of the Peninsula. From Cancún to Chetumal, the Riviera Maya offers beautiful beaches, diving, surfing, excellent food, great folks, laughter and dancing. Remains of numerous ancient cities dot the coast, as well as a few kilometers inland, where other opportunities abound to learn the fascinating history of the Maya peoples’ past and present.